How's it going? I'm still back east, and lovin' the seafood!! The first thing I think about in morning is...mmm...what should I eat tonight...lobster? scallops? crab? I think I may go into a food coma by the end of the week (hehe). I've recently been asked to design baby Thank You cards, so I'm warning you now, there may be a lot of baby themed cards coming your way as I create some options for the mommy-to-be. The mommy knows she is having a girl, and has just recently picked out her bedding for the nursery, which will be pink and green. I need to keep in mind that these will be mailed out, and I don't want to have the mommy have to worry about including extra postage on the envelope, hence the clean and simple design. Don't know why, I don't use this more often - the Cuttlebug baby carriage is adorable. 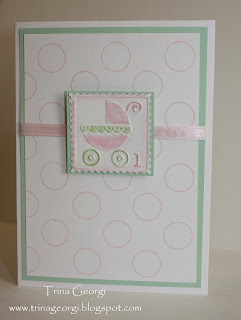 I used the die cut that came with the Cuttlebug to cut out the image, colored it by using SU chalks, and then created a polka dot background using PTI Basic Dots, added some pink ribbon, and done...fast and simple. Okay...so that was Option #1. Stay tuned as I create more samples for the mommy.